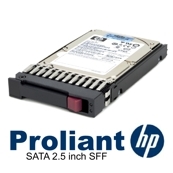 HP SATA Hard Drives are designed for the reliability and larger capacities demanded by today's entry server and external storage environments. HP SATA Midline Hard Drives are designed with economical reliability and performance for external storage backups and archival applications. Midline SATA Hard Drives provide the best price advantage for non-mission critical applications with low workloads of 40% or less. HP SATA Hard Drives are available in both Large Form Factor (LFF) 3.5-inch and Small Form Factor (SFF) 2.5-inch.